My retired neighbor that lives behind us has started throwing buckets of bird seed on the ground and in the middle of her backyard. I’ve never seen this approach to feeding birds before. I get a view into her retired days through my kitchen window because I’m often in the kitchen. Now a few mornings a week, there are more black birds than I can count ascending on our neighborhood, swooping in and out in coordinated hoards. It’s like a Hitchcock film or Game of Thrones, depending on how far back you like to take your references. My sister-in-law is frightened of birds, she once grabbed my arm when a bird flew into frame at the movies, so I’ve thought about approaching our neighbor and telling her we just can’t have this in case she comes over. More realistically, though, I’ll say nothing and continue to call Marc over to the window when a new hoard flies in. If I ever had the nerve to talk birds with my neighbor, maybe I could bring a slice of this tiramisu as my white flag. It’s certainly special enough to mend fences and win friends. I may have gotten a little carried away with the photos on this one, but this summer tiramisu is the no-bake dessert of my dreams. I brought it to a pool party and everyone played, “guess the fruit on top” because the apricots were so vibrant that people didn’t think they were real apricots. 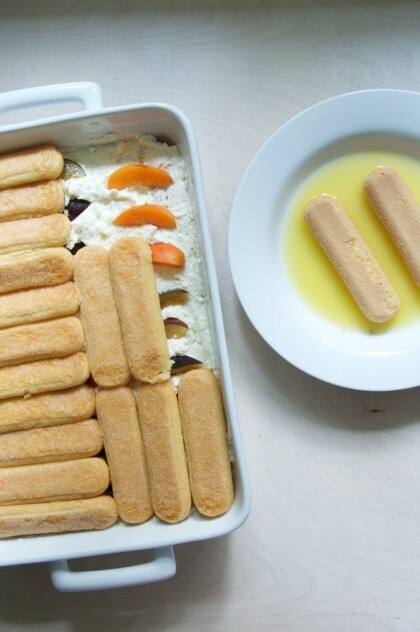 The more classic tiramisu I make uses egg yolks blended into mascarpone and the lady fingers are dipped in a mixture of coffee and rum. 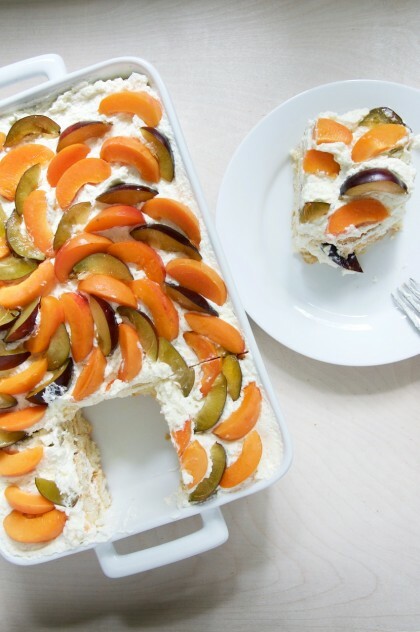 This summer version is kid and pregnant lady friendly with a mix of mascarpone and whipped cream as the filling while the lady fingers are dipped in orange juice for a bright and sweet flavor. 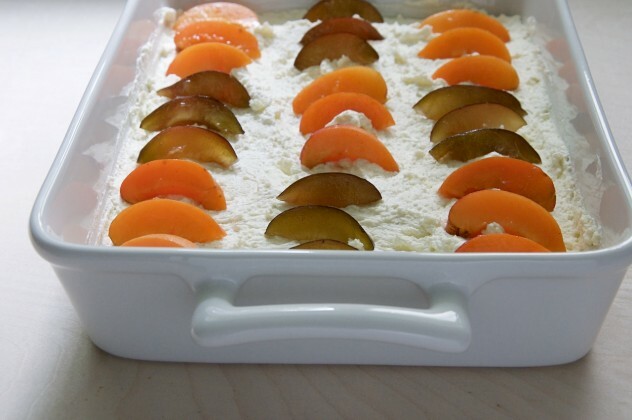 There’s barely any sugar in the cream to balance out the sweetness from the orange juice-soaked lady fingers and ripe fruit. 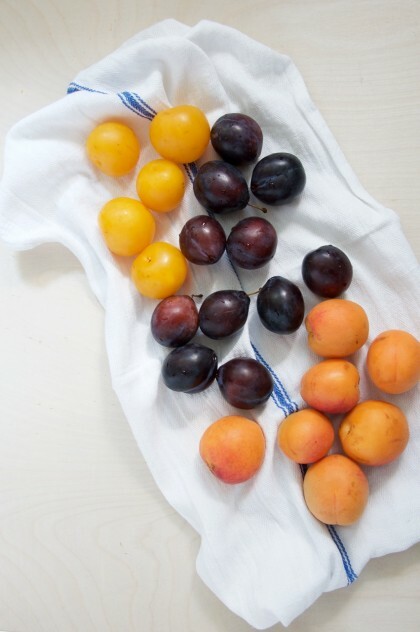 Use whatever summer fruit that looks good at the market and you’ll have a winning dessert. And you never know, it just might help you talk things out with your bird-loving neighbor. Depending on your 9×13, you may not use all 48 lady fingers. 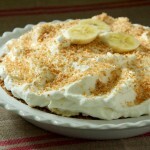 If you like your desserts on the sweeter side, you can increase the sugar in the filling by a few tablespoons. In a mixer, whip heavy cream to stiff peaks. Transfer to a large bowl, scraping the bowl clean. 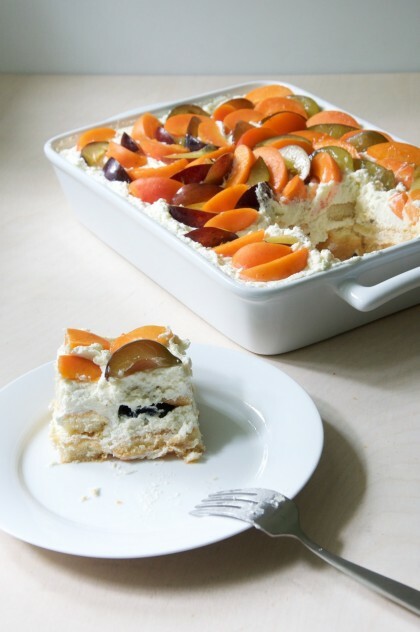 In the same mixer bowl, whip mascarpone, sugar and vanilla beans seeds until light and fluffy. 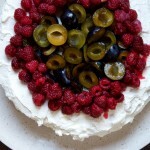 Fold mascarpone into the whipped cream. Get a 9×13 pan ready. In a shallow bowl, pour half of the orange juice. Dip each lady finger into the orange juice for a few seconds per side. Place in the bottom of a 9×13 pan and fit lady fingers together tightly. 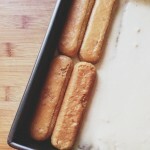 Make one layer of lady fingers. Spread half of the mascarpone/whipped cream mixture over the lady fingers. 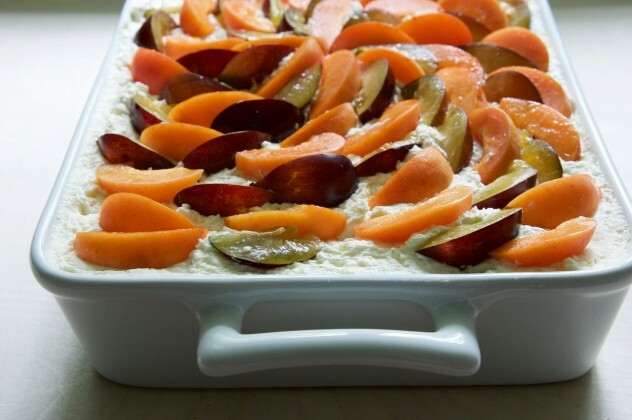 Place half of the plums and apricots over the cream. Place the rest of the oj in the bowl and complete another layer of lady fingers in the pan, pressing down as you go. Cover with the rest of the cream mixture. Place the rest of the apricots and plums on top in whatever decorative way you like. 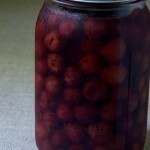 Refrigerate at least one hour. I’m massively afraid of birds and if I had a neighbor who did that I would faint and definitely scream. Sorry to hear about your bird phobia, Carrie! I guess more people have it than I thought. Maybe I should let my neighbor in on this fact, huh? Oooooh girl. This is SUCH a brilliant idea! 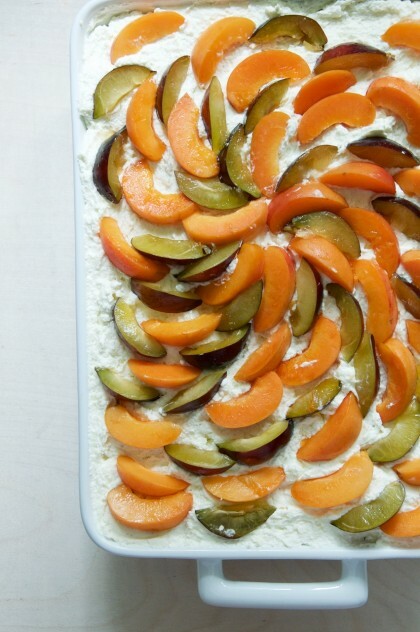 Why have I never added fruit to tiramisu before? G-E-N-I-U-S. I have a good friend who’s afraid of birds also. It’s a thing! Those lady fingers are such a great no-bake dessert starter, I couldn’t help myself 🙂 I had no idea how many people are afraid of birds! I guess my neighbor does not realize the terrifying back yard she is creating for some people! WHAT. This is a game changer. Ha! 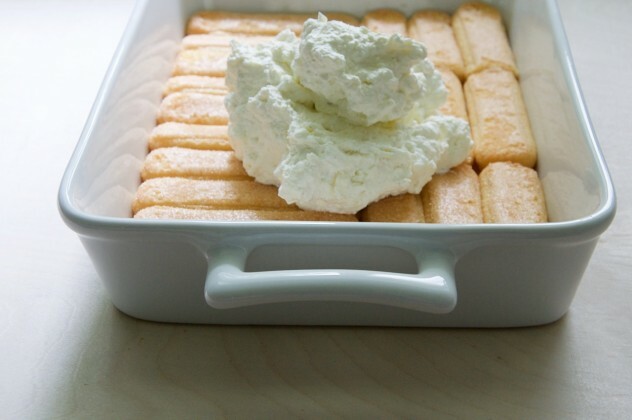 Those little ladyfingers are pretty versatile!